Students at Doughty Montessori School are actively involved with their own learning. Experiencing and discovering the materials at their own pace, growing in self esteem and cultivating their own desire to learn, becoming autonomous learners. 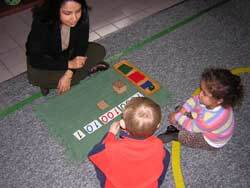 Math: the pre-math foundation includes the use of concrete, manipulative materials for learning beginning mathematical concepts. With emphasis on the development of spatial and size discrimination, we strive to give the children the ability to understand concepts then use those concepts to develop solutions. Language: the children learn reading readiness skills including oral exercise, left to right sequence, auditory perception, visual discrimination, language growth, and comprehension. We use a phonetic based approach, advancing to whole language and sight words. Sensorial: children learn by using all their senses. We focus on sensorial exploration, imitation, initiation, pattern completion, and classification of the relationship between objects. Everyday Living: this area includes care of self, care of the environment, grace and courtesy. The children achieve order, coordination, cooperation, and independence. 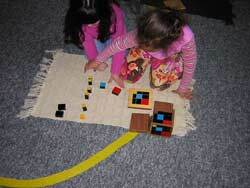 Geography and Cultural Studies: Montessori’s education places emphasis on the cultural curriculum. We introduce the children to the whole universe and the connection between every living thing to create harmony in our world. Learning to accept and appreciate cultural differences is crucial to the development of world peace. Music and Movement: since movement is intimately connected with learning, we bring music and movement into the classroom on a daily basis. Songs, finger play, balance beam, tumbling, yoga, are just a few of the activities that incorporate large and small motor skills. Art: creativity flourishes in an atmosphere of acceptance and trust. In an environment that encourages creative development, materials are introduced which stimulate interest and involvement, with an emphasis on the sensory aspects of experience. Extended Curriculum Areas: Spanish, dance and computers. Copyright © 2004 Doughty Montessori School.